Nicole's Needlework: Christmas Garden Finished! 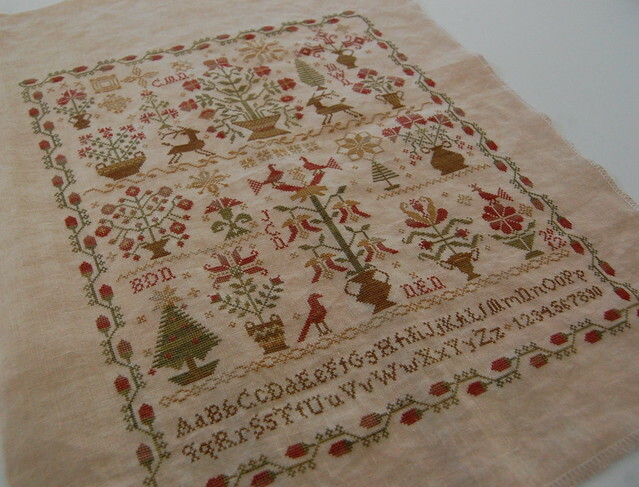 Blackbird Designs "Christmas Garden", a photo by Nicole's Needlework on Flickr. Beautiful! Huge congrats to you. So beautiful! Congrats on the finish! It's fabulous, Nicole! I'm so jealous!!! LOL! Just beautiful~~~ I have this one in my basket to start....hmmm....maybe I'll be working on it when I see you SOON at MB.... Can you believe its nearly time??? YIPPEE! Oh, Nicole! It is a Thing of Beauty! Well done! That is so pretty....need to add that one to the list! You are on a stitching roll... happy stitching.! Congrats on your finish... it's so pretty. Wow that is gorgeous! I love it! Nicole your Christmas garden is stunning! Makes me want to get mine out and start it right this minute!! It is just gorgeous Nicole! I need to get started on this one! BEAUTIFUL!!! I love the colors you used Nicole:) Congratulations finishing. Beautiful finish Nicole! The more that I see this one finished the more I love it! That's a beautiful finish Nicole! Congrats on your lovely finish Nicole!! Beautiful finish! Love it with the alphabet at the bottom! I love it! We start a sal just now! Fantastic finish! So many plans... wonder if I'll ever get around to it? Of COURSE. Only a few weeks now. woo hoo! Amazing! Congratulations on such a great finish! Love this samplers...the colors are beautiful! So very beautiful, Nicole !! You are a turbo stitcher!